How does a filmmaker keep the viewer entertained during a voiceover? 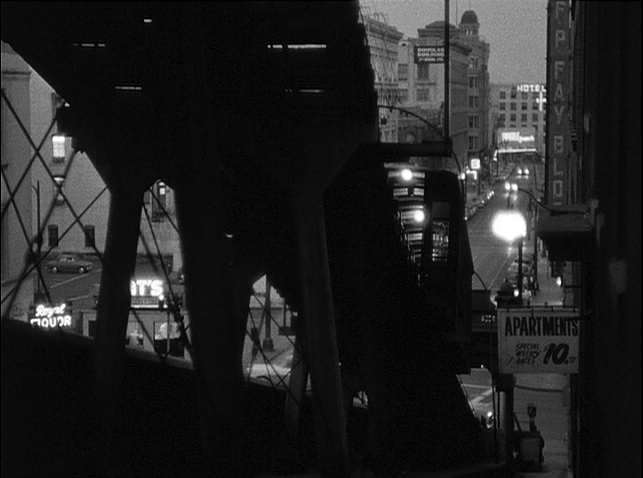 Director Kent MacKenzie used several voiceovers in this movie and his solution was to fill in the time with downtown street scenes filmed at night using the street lamps, retail shop window lights and neon signs as highlights. They were all located within a few short blocks. Then ... In this shot we can see the tower of City Hall in the upper right corner. 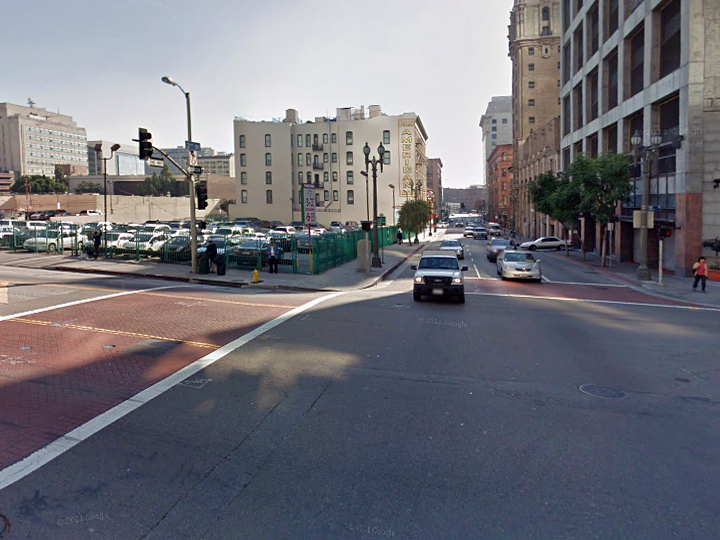 ... and Now, the view looks north along Main Street with 3rd Street crossing in the foreground (map). City Hall is still there but the corner building at left has had the upper two stories removed. What is unusual is that its retail stores were left in place - the previous location showed surviving threshold tiles in one of the stores in this block. Then ... Here's a bustling street corner. ... and Now, this is at the same junction as the prior scene, Main at 3rd. 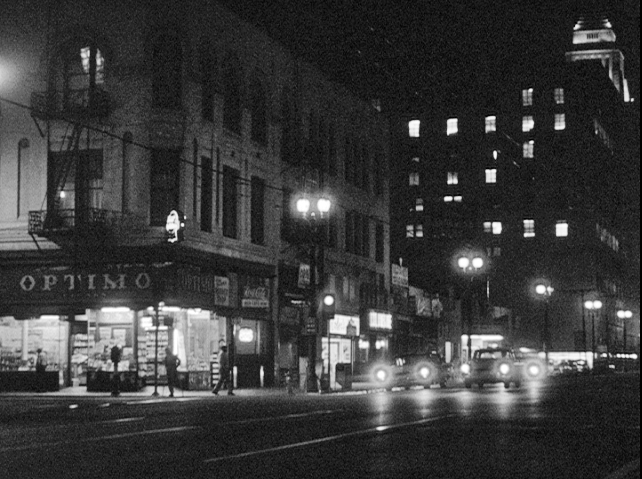 The store on the left, on the northwest corner, is now the Persian restaurant Shish Kebob but back then was called Optimo (you can see it in the first 'Then' image above). El Progreso across the street was at 260 S. Main Street but this half of that block is now a parking structure. Then ... This was filmed from below the Angels Flight funicular as one of its cars approached the lower terminus at Hill and 3rd (map). As we look east from here along 3rd Street the F P Fay Building sign is seen at right across 3rd and that hotel facing us a few blocks down is the St. George at 115 E. 3rd Street. Hard to see from here but below the word 'HOTEL' is a stylized 'One Dollar' sign, its daily room rate. ... and Now, the funicular has been moved a half block south along Hill Street and the old F P Fay corner building on the right has been replaced by a parking structure. The St George hotel, distantly small in this non-telescopic photo, is still there, now providing low income housing. 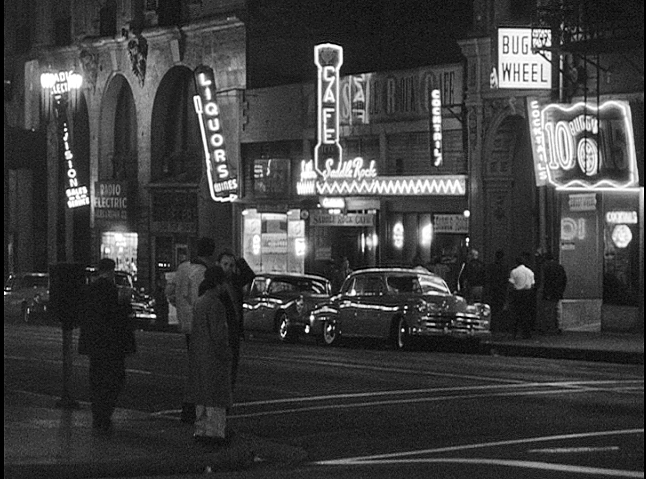 ... in 1952 ... the St George survived a fire a few years before The Exiles was filmed, captured in the photo below which clearly shows the stylized 'One Dollar' neon signs (the one on the left is the one visible in the 'Then' image above). Incidentally the Enderle hardware store, on the left below, and a recent photo of the St. George can be seen here in an earlier post. Then ... More drinking joints but this shot includes an architecturally interesting building on the left. This is the south side of the 300 block of 3rd Street (map). From left to right were Radio-Electronics at 316 S Main, a liquor store and Saddle Rock Cafe at 320, the posh entrance to the F P Fay Building at 326, and Buggy Wheel Cafe at 328 (most bars in those days seemed to prefer the pseudonym 'cafe'. Who were they kidding?). ... and Now, the stylish building with the arches, an extension of the Metropolitan Water Board Building, is still there but those on the right including the F P Fay building have been replaced by a parking structure.